Who was the wife of the 3rd Duke of Norfolk and what do we know about her? Elizabeth Stafford was the daughter of the ill-fated Edward Stafford, 3rd Duke of Buckingham and Eleanor Percy, eldest daughter of Henry Percy, 4th Earl of Northumberland. She was born in 1497, so one can assume that she was named for the queen consort, Elizabeth of York. Edward then attended the coronation of the new Tudor king, Henry VII. In November 1485, after the reversal of the 2nd Duke of Buckingham’s attainder, Edward was restored to his inheritance. He was now the 3rd Duke of Buckingham. This should give you an idea of what Elizabeth’s father’s childhood was like. She was surely brought up with the same values as her father was taught by Margaret Beaufort. Like most women of the time-at least women of noble birth, Elizabeth Stafford was educated at home. University was only for their male counterparts, of course. Elizabeth’s father, the Duke of Buckingham, had originally promised to marry his daughter to his ward, Ralph Neville, 4th Earl of Westmorland – that is, until the recently widowed Thomas Norfolk-then the Earl of Surrey-came knocking. Elizabeth is quoted as writing this about Ralph Neville: [H]e and I had loved together two years’ and her plan was to marry him before Christmas”; but Howard and her father had other plans for the young Elizabeth. Thomas Howard wanted Elizabeth Stafford for his second bride. Buckingham, seeing as his daughter had already been promised in marriage to Neville, he offered one of Elizabeth’s younger sisters in her place. 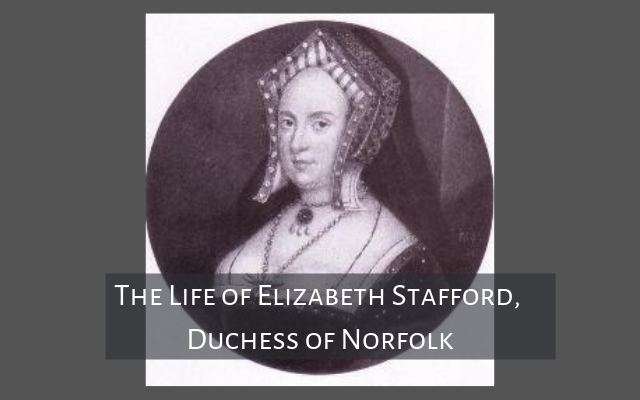 Norfolk declined the offer because Elizabeth was the eldest daughter and with her came more wealth. Eventually an agreement was reached between Buckingham and Norfolk, and the couple were married in 1513. What a powerhouse marriage that must have been seen as; the Buckinghams and Norfolks. Elizabeth became Countess of Surrey upon their marriage at the tender age of fifteen. Howard, was twenty years her senior at 35. Upon their marriage, Thomas Howard received a dowry of 2000 marks, while Elizabeth was promised an annual income of 500 marks. Per reports, this was an income she never received. With that being said, Elizabeth, like most women, had hoped to marry for love. She believed that her marriage to Howard would be just that. We are soon to discover it was not in the cards for the two of them. Elizabeth was a dutiful wife. In 1520, she and her children moved to Ireland with Thomas where he was to serve the King as lieutenant of Ireland. Despite being away from all she knew, Elizabeth loved her husband and was loyal to him. In 1521 Henry Stafford, 3rd Duke of Buckingham was executed for treason. There is no evidence to declare how Elizabeth felt about it while she far away in Ireland. We must assume she mourned the loss of her father. Unfortunately any happiness she found with her husband would soon be over. Thomas Howard, now the Duke of Norfolk took a mistress in 1527. She is someone you’ve certainly heard of; her name was Bess Holland and she was the daughter of his private secretary. Bess Holland, as stated, was the daughter of the duke’s secretary and household treasurer. At the time she became the duke’s mistress, she was one of Anne Boleyn’s attendants (prior to her time as queen.) Howard then installed her in his household, thereby deepening his estrangement from Elizabeth. The Duke and Duchess had several children together, but we know two of them the best: Henry Howard (Earl of Surrey,) and Mary Howard (Duchess of Richmond and Somerset). In December of 1529, Henry VIII requested that the Duke of Norfolk’s son (the earl of Surrey) become a companion to his illegitimate son, Henry Fitzroy. It was at this time that a marriage was arranged between the Duke’s daughter Mary and Fitzroy. While many have said the marriage was Anne Boleyn’s idea-she was the niece of the Duke of Norfolk- it had always been maintained by Norfolk that it was the idea of the King. Regardless, the marriage between Fitzroy and Mary Howard had definitely been promoted by Anne to help strengthen her ties to the throne. Like the later marriage of Henry VIII and Anne of Cleves, there was no dowry expected with the marriage of Mary and Fitzroy, which was unusual for the time. This may indicate the influence that Anne Boleyn had over the king. Elizabeth Stafford was totally against her daughter’s marriage. Elizabeth had served Katherine of Aragon years earlier and was loyal to her cause, however she was thrust into serving Anne Boleyn and was not happy about it. Elizabeth was vocal about her opinion on the annulment proceedings, which resulted in her being exiled from court in 1531. When her son the Earl of Surrey returned from his time in France with Henry Fitzroy in September 1533, he was about 16 years old and returned to a different England than the one he left in October of 1532: Anne Boleyn was now Queen, her daughter Elizabeth was now heir to the throne, and the King was newly dubbed Supreme Head of the Church of England. In addition to all the change in England, Henry had also returned to a very different family situation at Kenninghall. His father’s mistress, Bess Holland had essentially replaced his mother who was in disgrace for her actions at court. Elizabeth was eventually sent to Redbourne in Herfordshire where she lived in a state of virtual imprisonment with a meagre annual allowance of only £200, and in the spring of 1534 she said that her husband ‘locked me up in a chamber, [and] took away my jewels and apparel’ (LP Henry VIII, 12/2, no. 976). Elizabeth’s husband attempted to persuade her to agree to a divorce by offer of ‘material awards and the return of her jewels and clothes,’ yet she would not agree. As state earlier, Elizabeth was opposed to the marriage of her daughter Mary. She quarrelled openly with Norfolk over the arranged marriages and primarily disapproved of them due to the involvement of the perceived concubine, Anne Boleyn. In the letter, one she wrote to clearly get Cromwell’s attention about the abuse against her, Elizabeth alleges rather awful treatment against her; some of which seems too extreme to believe. That is, until we remember what her husband was recorded as saying to the King’s daughter, Mary, in response to Mary not recognizing Henry VIII as Supreme Head of the Church of England and that her parent’s marriage was never valid. He stated that if she was his daughter, he would “bash her head into the wall until it was as soft as a baked apple.” That was a year before Elizabeth wrote her letter to Cromwell. Norfolk wanted a divorce. Elizabeth, like Katherine of Aragon, refused to give one to him. I get the impression that Elizabeth was playing dirty, a different trick than her dear friend Katherine of Aragon used. She even claimed that Norfolk assaulted her as early as 1519 (six years into their marriage) during the birth of their daughter Mary. When Norfolk discovered what his wife had said, he sent a letter to Cromwell and called her out as a liar, as he would never harm an unborn child. He said, “My good Lord, if I prove not by witness, and that with many honest persons, that she had the scar in her head fifteen months before she was delivered of my said daughter” – due to a procedure she had done by a surgeon in London. Elizabeth took her husband’s threat very seriously and is quoted as saying, ‘I know well, if I should come home again, my life should be but short’. The Duchess was surrounded by enemies, and she had little support in her cause because she was a woman in a man’s world. Her voice really did not matter-however, in order to obtain his divorce, Norfolk would need Elizabeth’s consent, and she wasn’t going to give it. Even her children had turned against her and sided with their father. Author Jessie Childs in “Henry VIII’s Last Victim” claims that Surrey probably sided with his father because Elizabeth had the nerve to approach Cromwell for help-Cromwell was the man Norfolk detested above all others. Her daughter Mary, Duchess of Richmond, also sided with her father. Not only did she side with him, but she became good friends with Bess Holland. Whether Mary did this for self-preservation or that she supported her father for real, we do not know. By the 1540s, Elizabeth had reconciled once again with her brother Henry, but not with her husband who was still with his mistress. In 1554, When the Lady Mary became the first Queen Regnant in England, Elizabeth was able to return to court-she even carried the Queen’s train at her coronation. Quite an honor! Elizabeth died on 30 November 1558 (around 61 years old) and was buried in the Howard chapel, at Lambeth. After doing all this research on Elizabeth Stafford, Duchess of Norfolk, I realized how much Mary Howard turned out to be like her mother. She was proud, and she stubborn. Those two traits are clearly something she inherited, or at least learned from her mother’s actions. It makes me wonder if Elizabeth was proud of her intelligent daughter, for standing up for herself.